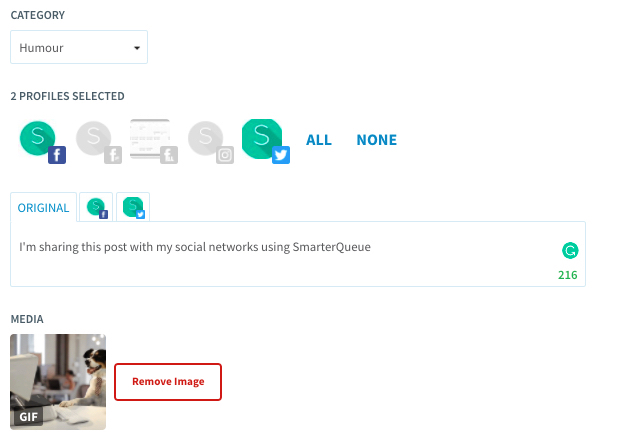 Any GIF that you share from SmarterQueue will be added to My Media, a library of all the GIFs, videos and images that you’ve used in SmarterQueue. You can search My Media while on the Post Editor or Find Content page. In the popup that appears, select My Media. The My Media window will open. Your media library will appear unfiltered, showing all your images, GIFs and videos. Using the filter on the left, change the view to show your GIFs. On the left sidebar of the Find Content page, you can search My Media for post inspiration. 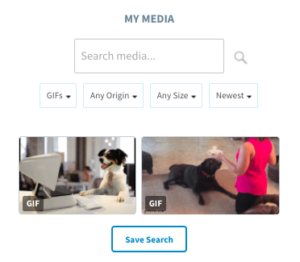 Selecting any of your existing GIFs from this search will create a new post with that GIF. 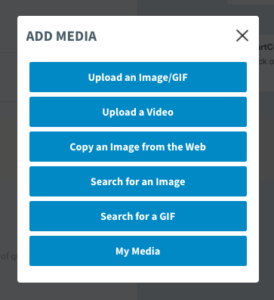 GIFs can also be shared between posts and different profiles, by finding the GIF on an existing post (in your queue or past posts) and clicking ... to access more options. Then, choose Duplicate to create a new post with that GIF. GIFs can be large files, so if you’d like to reuse the same GIF you should copy an existing post instead. With your GIF copied, you can change any of its parameters to share it again.